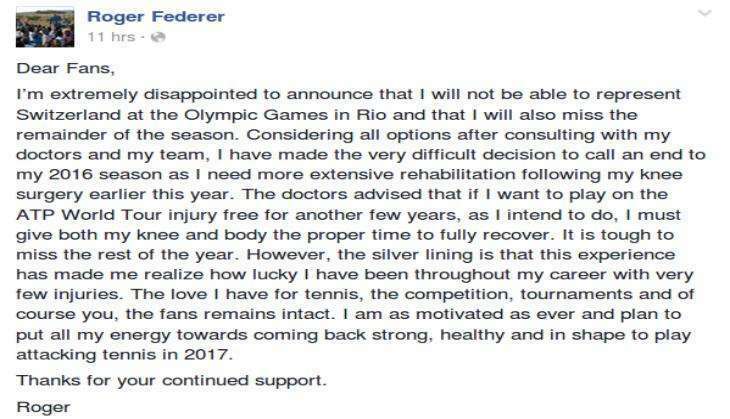 Roger Federer has pulled out of the Rio Olympics 2016 and rest of the 2016 season due to a knee injury. The tennis ace, who will turn 35 in August, underwent knee surgery in February before missing May's French Open with a back problem. "I'm extremely disappointed to announce that I will not be able to represent Switzerland at the Olympic Games in Rio and that I will also miss the remainder of the season". "I have made the very difficult decision to call an end to my 2016 season as I need more extensive rehabilitation following my knee surgery earlier this year". Federer's injury also kept him out of the Roland Garros, which ended his streak of 65 successive Grand Slam appearances stretching back to 1999. An Olympic singles gold medal is the lone major prize to escape Federer in his record-breaking career, having finished runner-up to Andy Murray at London 2012. He added, "I am as motivated as ever and plan to put all my energy towards coming back strong, healthy and in shape to play attacking tennis in 2017."